FurReal Friends pets are here for you! They’re best pet friends who play all day, make you laugh, and love you back. These cuddly pals are here to give you unconditional love, laughter, and even a little touch of magic whenever you need it. Come on a journey that fulfills your ultimate pet-lovin’ dreams, where your imagination can soar and you can enjoy enchanted adventures with a very special pet friend! Join StarLily in the FurEver Forest! There are so many games to play and adventures to share. You can play a musical game in the Crystal Caverns and decorate The Wishing Tree, the beautiful home where StarLily lives! Travel to Rainbow Falls to splash and play in the water, and visit Sugarberry Orchard, where you’ll find the treats that StarLily loves so much. You can even help to make her world more magical! There’s no telling how many adventures you and StarLily can share when you play together in the app! Just ask a parent to download the app, and then follow StarLily – she’ll lead the way! 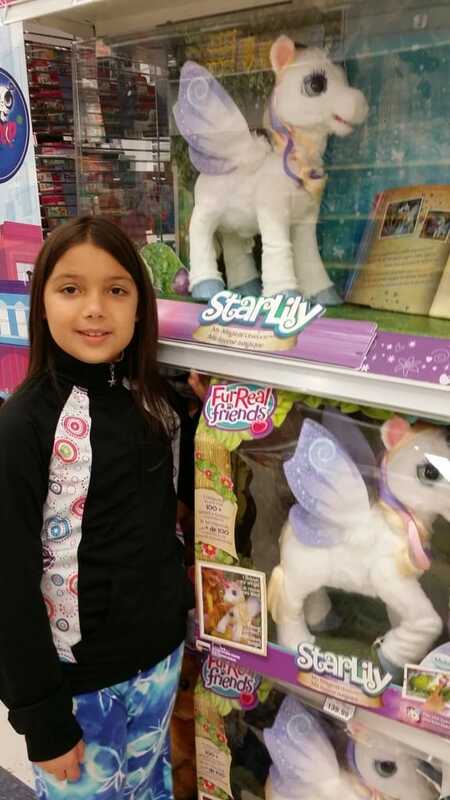 The more you play with StarLily, My Magical Unicorn pet, the better you and your unicorn friends will get to know each other. Whether you’re playing with her in the app or just cuddling and spending time with her, it’s sure to be an enchanted experience. 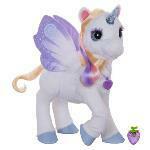 StarLily is every girl’s dream pet – and now the two of you can become the best friends ever! • Requires 4 “C” alkaline batteries, not included. • StarLily, My Magical Unicorn app works with select iPhone, iPad, iPod touch devices, and select Android devices. Check www.furrealfriends.com for instructions, availability, and compatibility info. Available at least through December 31, 2016. Not available in all languages. 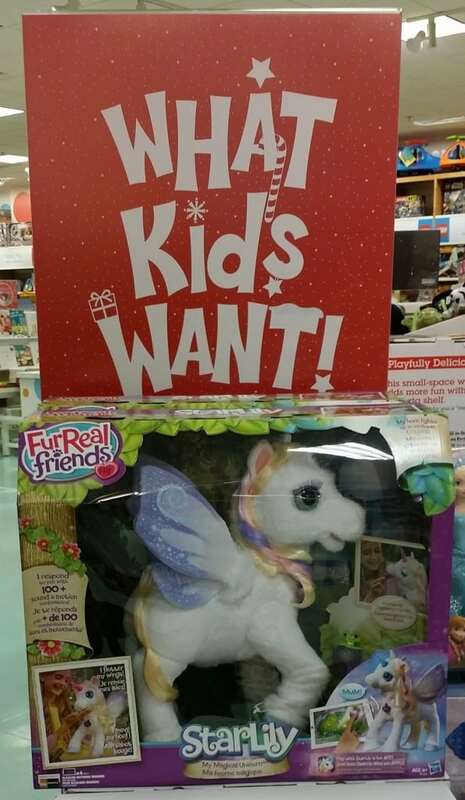 I have absolutely no doubt that Furreal Starlily will be a high demand, highly sought product this coming holiday season. She is an amazing product that is interactive and encourages imaginative play. She can also be played with via the App that has been created in order to bring her alive in the electronic world. With Starlily every type of play is covered. Whether you want an interactive toy, a plush to love, a friend to engage in imaginative play, or a friend to play with via an App, Starlily can do it all. The amount of things that Starlily says and can do is incredible. She totally surpasses 100 different things she says and does. The way she interacts and responds is quite wonderful. 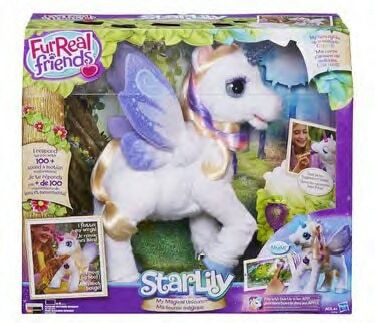 Starlily is a beautiful unicorn with majestic wings that flutter and move as well as an awesome horn that lights up in different colors all depending on her mood. Her hair is beautiful and will undoubtedly be endlessly styled by all those that come in contact with her. There really is nothing I can say that Hasbro needs to do to make Starlily any better than she already is. Starlily is a hot ticket item and I can see her selling out fast and being easily the top if not one of the top toys this holiday season. The App that you can download for Starlily is pretty awesome as well. Go here to make sure it is compatible with the smart device that you have. Yes, you can connect your Starlily plush friend to the App to have an interactive experience with her. Starlily is recommended for children 4 and older and I agree with this age rating. I believe that Starlily is one of those friendships that will be maintain between child and toy for a long time, possibly being handed down to next generations. I highly recommend that you check out Starlily. You can find her in your local toy stores under recommended holiday hot toys as I have been finding her here everywhere I turn. We love Starlily and she easily receives the MomMomOnTheGo seal of approval. Is this toy really worth the price? My daughter really wants one but I don’t want to spend that much money on a toy that is going to be discarded to the toy bin after a day or so. I think it all depends on the type of toys that your daughter likes to play with. If she likes stuffies, dolls, and such and brings them out to play with, then she will likely like Starlily. Starlily can be interacted with and played with like a doll/stuffie.